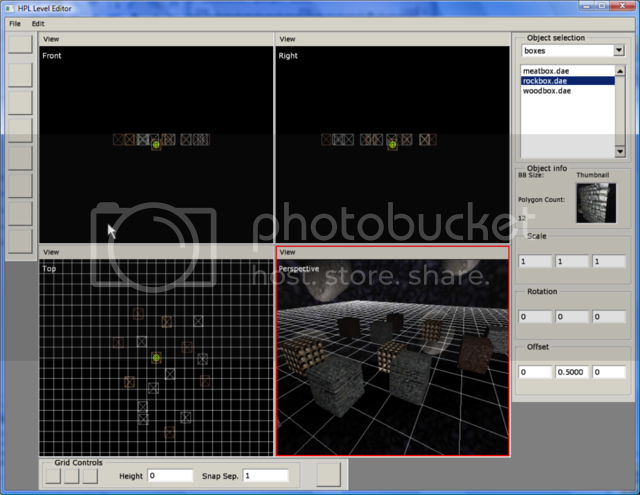 Luis, 2008-07-31, "HPL Level Editor Milestone 2: (Static) Objects in Space"
Hi all. Did you miss me? I've been quite busy lately, so I haven't been that able to drop by, but here I am again to show some progress on the Level Editor. The biggest change is that now you can add static objects (ie, stuff that isn't supposed to move around in the game, like walls, floors and so on). It works like this: you pick a set from the selector, now pick an object from the list, and then place it on the grid. 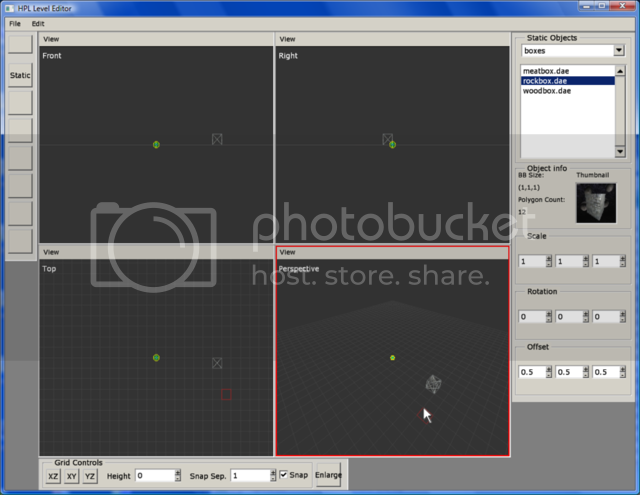 - Static object placement: can adjust scale, rotation and offset before placing. Also generates thumbnails of objects on loading the set. - Grid system, you can choose between a XY, XZ and YZ grid plane, and modify height and snap separation. - Wireframe and shaded rendering modes. - Orbiting, panning and zooming camera. - Undo/Redo system with configurable undo stack size. 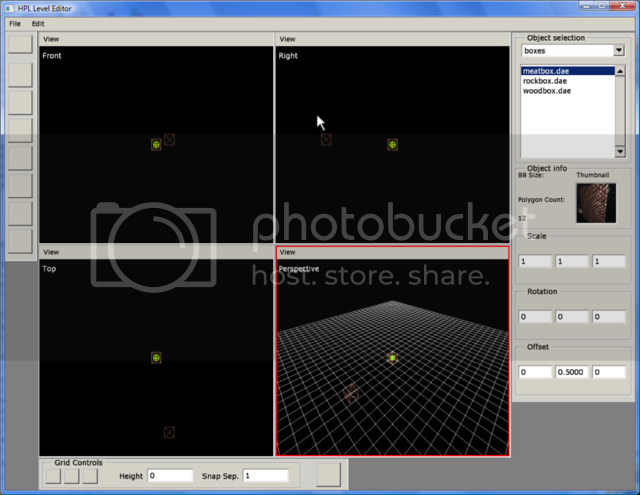 - 4 fixed viewports layout, with viewport enlargement option. RE: Luis, 2008-07-31, "HPL Level Editor Milestone 2: (Static) Objects in Space"
Lovely update; and what's that avatar from? Looks like a 70s show or something! 1: How varied will the wall selection be? Will it allow us to create unique styled rooms; or will any mods that strictly use the level editor to have the same style of geometry? Quote: he biggest change is that now you can add static objects (ie, stuff that isn't supposed to move around in the game, like walls, floors and so on). 3: Will there be vertices's/face manipulation? Will there be an option to increase the polies for each static object? 5: What is the crowd this level editor is aimed at? Users who have rarely/never used a model editor, or users who are familiar with using one? 6: What will be the experience slope on this? Will there be options that newbies find useless, but experienced users find useful? Mmm, Cool. This similar to Valve Hammer Editor right? At least it sounds like it. Hehe, thanks for the comments. Now for the answers. 0. My avatar: Some spanish cartoon named Enjuto Mojamuto. Not really 70s . 1. Well, there will be some sets, cannot tell how many and how varied at this point, but they should be varied enough to keep any map from becoming boring. Of course you can add your own wall sets if you feel like getting your hands dirty. 2. They will be similar to walls. 3. Don't think so, the aim is to keep the editor as simple as possible. 5. I'd say users who have rarely/never used a model editor, I mean, it should be quite simple to create a map. 6. Can't really tell at the moment, as there is no such thing as a complete feature list right now. 7. Right now there is some entity cloning tool, which can duplicate single entities and groups. This fits more in the next update, so I will not go into much detail now As for the math equation thingy, I don't think I really got you, so if you please..
@nackidno: I haven't used Valve Hammer Editor, just checked it a bit, and I don't think it's gonna be that similar. I know these screenshots aren't really showing much, so I will aim to post some videos in future updates. Oh, I just assumed. Let's see how this turns out in the end then! hmmm, wat game are these designs for? -A side-box that displays a selected model in 3-d form. Quote: 3. Don't think so, the aim is to keep the editor as simple as possible. How will we do "Sounds" or "entry boxes" or even "collsion Boxes" than? Quote: As for the math equation thingy, I don't think I really got you, so if you please.. The bars are supposed to look equal distance. That would be a really big time-saver on my part. 5: Ability to spawn anywhere, at anytime in the level. This would be purely for testing out puzzles that dont' relay on previous scripts to work. 6: A more flexable scripting process, or at least a better way to debug scripts.